Comments: BRAND NEW COPY, Perfect Shape, No Black Remainder Mark,Fast Shipping With Online Tracking, International Orders shipped Global Priority Air Mail, All orders handled with care and shipped promptly in secure packaging, we ship Mon-Sat and send shipment confirmation emails. Our customer service is friendly, we answer emails fast, accept returns and work hard to deliver 100% Customer Satisfaction! 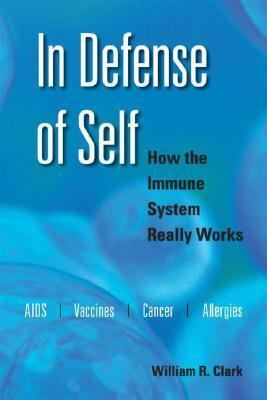 William Clark invites readers on a tour of the immune system, introducing some of the most important medical advances and challenges of the past 100 years, from the development of vaccines and the treatment of allergies, automimmunity and cancer, to prolonging organ transplants and combating AIDS.Clark, William R. is the author of 'In Defense of Self', published 2007 under ISBN 9780195335552 and ISBN 0195335554. Loading marketplace prices 158 copies from $3.09 How does the rental process work?